Textured carpet can work beautifully with any décor, from casual to formal. The textured carpet pattern is created out of a single color by giving some of the tufts added twist, causing them to curl back on themselves in random directions. These tufts in the textured carpet then reflect light differently than the straight tufts. 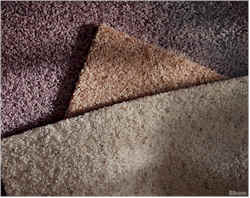 When the additional twist is given to all tufts, the style is called a textured carpet or textured Saxony. Textured carpet comes in both patterned and solid styles, and with an added twist of the fiber can help reduce the appearance of footprints and vacuum cleaner marks. Frieze and Trackless are both highly textured cut pile constructions. These are ideal if you are looking to minimize the appearance of footprints and vacuum cleaner marks. Frieze (pronounced "free-zay") carpets have tufts which are so tightly twisted they curl back on themselves in random directions. This creates a nubby or pebbled look. Trackless style constructions usually fall somewhere between a Textured Saxony and a Frieze. Both styles can be casual or formal; both are ideal for rooms with higher traffic. Textured patterns and Textured Saxonies are the best-selling carpets and work well in informal areas (such as family rooms and children's bedrooms) because of its soft feel. Textures are tightly twisted and texture heatset. They have a multi-colored look that disguises tracks. Usually plush carpet, low cut pile that leaves no footprint marks or vacuum cleaner marks.